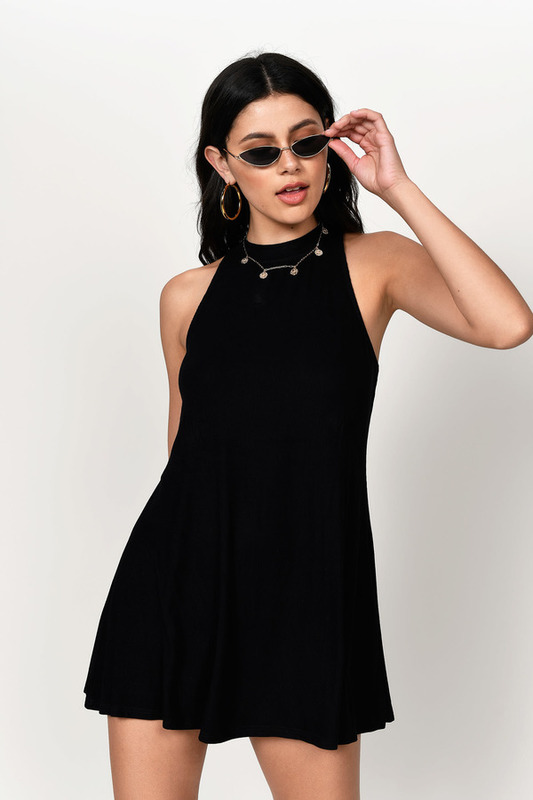 Check out Tobi's Carly Ribbed Shift Dress Grab your favorite heels and take the Carly Black Ribbed Shift Dress out dancing. This sleeveless mini dress features a high neck, racerback, and a flared skirt, perfect for gettin' your groove on. Pair this bar dress with statement earrings. Grab your favorite heels and take the Carly Charcoal Ribbed Shift Dress out dancing. This sleeveless mini dress features a high neck, racerback, and a flared skirt, perfect for gettin' your groove on. Pair this bar dress with statement earrings. Grab your favorite heels and take the Carly Black Ribbed Shift Dress out dancing. This sleeveless mini dress features a high neck, racerback, and a flared skirt, perfect for gettin' your groove on. Pair this bar dress with statement earrings. Black, Charcoal modeled on a size Small.